We are pioneers of the financial add-in and toolkit market segments and have been continuously providing leading edge analytical solutions since 1988 and have one of the longest successful track records in the industry. We regard this as essential since every sale is the start of a long term partnership. The UNIVERSAL Add-ins are all implemented as function calls in a Dynamic Link Library (DLL), thus assisting in the ease of use and integration into the user's analytical environment. They can therefore be called from Excel, Access, Visual Basic, C, C++, Fortran etc. This object-orientated building-block approach provides unequalled speed, cost-effectiveness and flexibility. With our theoretical, technical, and practical expertise, we also undertake bespoke system development projects to develop customized solutions for our clients. We provide customized risk management training which uniquely combines analytical excellence with technological solutions, at either the client's or our premises. We also provide training and consultancy sessions remotely using Web Conferencing software. All training would be tailored to the participants' backgrounds, whether they are traders, technology or internal audit professionals. This could include solving real life problems which the participants are struggling with. We also provide an analytical consultancy service to assist clients integrate our technology into their existing in-house system. MBRM's technical support is excellent since the software has been designed and implemented in-house. You can download a free fully functional 30 day trial of all of our UNIVERSAL Add-ins for Windows from our MBRM Web Service at any time. 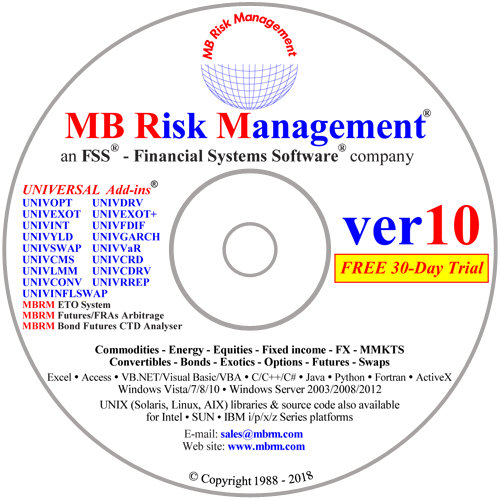 Just click on the CD-Rom picture in the left side of this page to be taken to the MBRM Web Service from where you can register and immediately download the software. The UNIVERSAL Add-ins are used world-wide in mission critical applications by most major Investment Houses, Money Managers and Corporate Treasuries. Our client list reads like a Who's Who encyclopedia of all the major players in the industry from central banks all the way to sole traders. The decision to use your Excel add-ins at the Central Bank has been made. If Dr. Barakat is ever visiting our city, we would be very pleased to welcome him at the Central Bank..